Funding is welcome from individuals or governments, funding agencies or companies, by sponsorship or donation. Support from any source is essential to the sustainability of all our projects. We accept donations in the form of goods too. And if you can offer any help, advice, or support for any of our projects in other any way, your support and donations will be received with thanks and appreciation. We are always in need of new and used clothing in good clean condition; blankets, sheets, towels, facecloths, canned food, formula baby milk, skin emulsifiers, toiletries, rice and food items, house cleaning products, household items, furniture, baby items, computers and related equipment. All donors/sponsors receive a personal thank-you letter. Rejoice currently directly assist over 700 HIV+ patients and their families regularly on a weekly basis. The children of these patients and HIV/Aids orphans are eligible for educational scholarships. Currently 72 children have scholarships through Rejoice. All, in one way or another, are affected by the virus and their extended families are finding it extremely difficult to make ends meet. They have become much poorer and many are finding it difficult to come to terms with the additional hardship and responsibility of living with HIV. Many extended families cannot cope with the increased costs of caring for an addition child (or children) and have no option but to put the child into an orphanage. be a significant factor in deciding whether the child continues his/her education to high school, college or university. 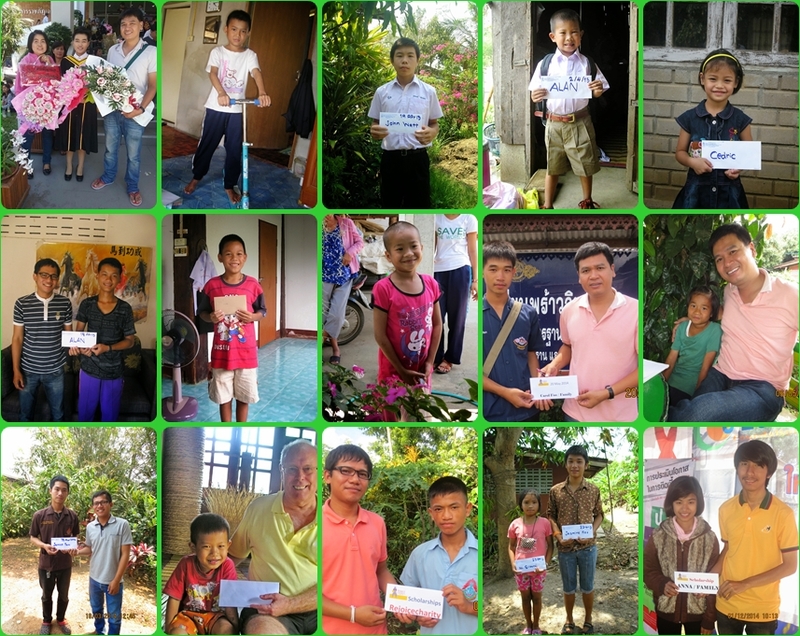 Currently the project asks for sponsors to make a one-off donation of either, at least 5,000 baht (for pre-school, primary and secondary school students) or, at least 7,000 baht (for high school) or, at least 10,000 baht for (college/university students). The excess goes towards providing formula milk, medicines, provisions and fuel for Rejoices mobile outreach and home care clinics. Please specify which age group you would like to sponsor (pre-school, primary, secondary or high school/university). Also, if you wish, you can specify whether you would to prefer to sponsor a boy or a girl. We make a PDF file for each child into which can be added any correspondence or photos. We will translate any letters and add them to the PDF file. (here is an example). Bank details for donations can be found on the"Donate" Page.